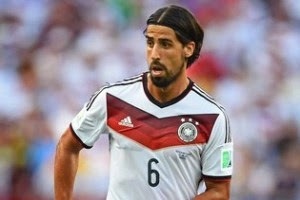 It has been reported that Arsenal have tabled a bid for Real Madrid midfielder Sami Khedira. The Daily Express says Real are more than willing to let Khedira leave as they line up moves for Toni Kroos and James Rodriguez. The German international battled injury last term and was not impressed by Real’s offer of a new contract this summer. Reports in Spain suggest that Arsene Wenger has obviously seen enough to persuade him to spend a substantial fee on the former Stuttgart man. Arsenal have lodged a £24 million offer for the midfielder.